Steve has been delivering lectures on his rock climbing adventures and top level performances for over 15 years. He has spoken to a wide range of audiences from local climbing clubs to corporate events. 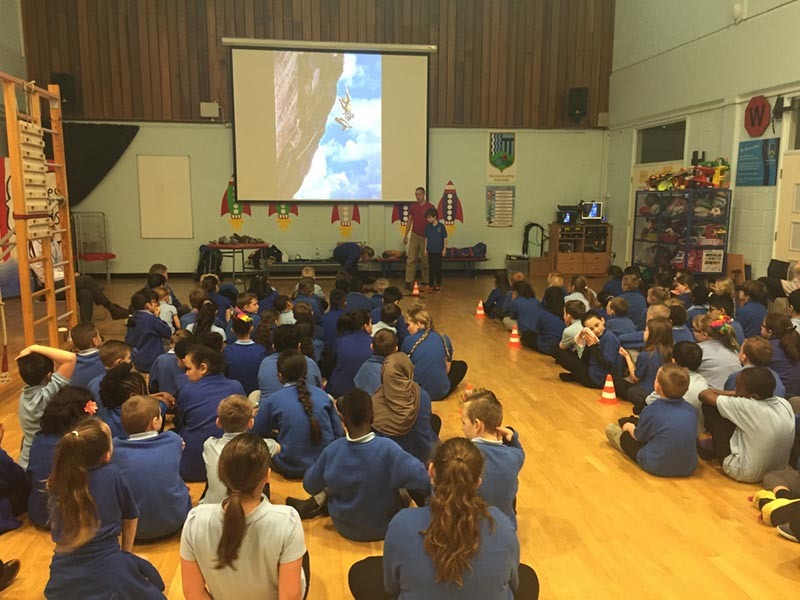 More recently, from 2014, he has delivered fun orientated motivational and educational talks to primary schools. 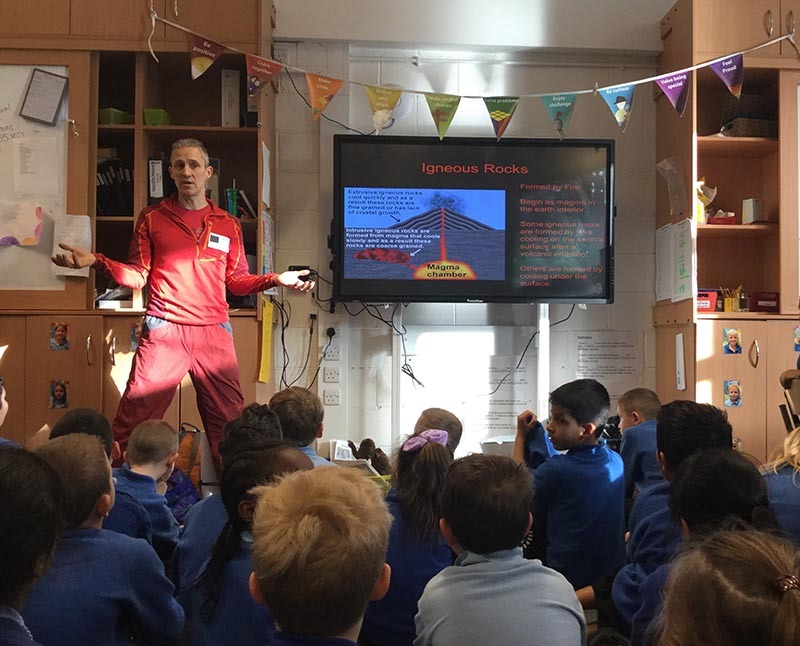 Working alongside the syllabus for Y3 and Y4, Steve’s talks are designed to introduce and expand on geology and geography, concentrating on the formation and characteristics of different rock types, where they are found around the world, and how these effect the sport of rock climbing. A selection of samples including limestone, sandstone, slate, granite, shale and gritstone are all available for the children to touch and feel where they can note roughness, weight and other characteristics. Steve also talks in detail about his performance climbing, with photographs and video of his ascents of the hardest climbs in the UK. With 20 years at the top of the sport, Steve talks about the dedication, motivation, sacrifices and rewards of achievement. Key messages are about not giving up, setting goals, working towards them in small steps and taking risks. Each talk has a number of ‘practicals’, where children are invited to test their strength against climbing related exercises. With a strong emphasis on fun and involvement, and working closely with each school, each talk can be tailored to fit with current assembly topics, and optimized for each class dependent on where they are in the curriculum. Typically each session will fit a morning or afternoon, with 60-75 minutes on climbing followed by a break and a further 60 minutes on geology. Steve valued and encouraged children's contributions, remembered them and went back for further input. Great message about not giving up, setting yourself goals, working towards them in small steps, taking risks - all very relevant to our children"
"Just wanted to let you know how successful this morning was. The children absolutely loved it and have learnt so much. There were so many great questions asked by the pupils. The sessions were targeted at the appropriate level and the interaction was great for all! They especially enjoyed the hanging wall!!" "Engaging and passionate speaker, knowledgeable about his subjects, explaining information in a child-friendly manner. Brilliant photos and videos to bring the subject to life, with interactive/hands on activities and challenges. Encouraged children to take up an activity that might be different from the usual football etc."